Lectures will held be on Wednesdays at 11 am and will be located at the St. Albans Museum, on the third floor, corner of Church and Bishop Streets in St. Albans. The lecture site is handicap accessible with parking available behind the museum. Rob will perform some magic tricks (which he won’t explain) and teach you some magic (which he will explain). Come learn a few simple tricks with everyday objects to mystify, amuse and awaken the grandkids! Feel free to bring a notebook so you remember how to do the tricks at home…and have fun! Historically the Smiths have been described as the ‘family that transformed St. Albans’, a dynasty of politicians, entrepreneurs and philanthropists, whose efforts defined the heritage of the ‘Rail City’. Franklin County, the State of Vermont and beyond for generations. This presentation (part two) will explore additional moments in the lives and legacy of the Smith Family, including regional architecture. In late September of 2018, John joined 22 other OLLI members who signed up for a group tour of Spain and Portugal. With John’s photos, videos and photo contributions from several fellow travelers, he will present a slide show of his eleven day trip to the lands of Don Quixote and Sancho Panza and Vasco de Gama (first to open a sea route to India in 1497-99). Jim will be addressing our St. Albans OLLI audience with the same level of passion he has demonstrated doing the hundreds of presentations he has given to give to high school student driving classes throughout Vermont for the last nineteen plus years. Jim will be modifying his presentation, recognizing that most older drivers are faithful seat belt users, to note that other factors of aging are often cause for concern. In addition to teaching safe driving skills, Jim is passionate about organ donation and has been instrumental in the significant increase in the number of drivers checking the organ donation option on their drivers license. Jennifer DeMaroney is the Organ Donation Procurement Coordinator at the University of Vermont Medical Center and will be answering any questions about the process of organ and tissue donation. The UVM Morgan Horse Farm in Weybridge is dedicated to the preservation and improvement of the Morgan Horse through breeding and selection. Margot will review the establishment of the breed, the reasons why the UVM ‘government’ line of Morgan Horse is considered one of the best in the world, and the outlook for this superb pleasure horse. St. Patrick in St. Albans! Join Vermont Public Radio host and Vermont musician Robert Resnik and his longtime bandmate Marty Morrissey for a return visit to the St. Albans OLLI on Wednesday, March 13, with a program of Irish music, featuring songs and tunes from the Emerald Isle, including some which originated in Vermont! I will provide the audience with a brief review of my quilting background, a ‘trunk’ show of my quilts with particular emphasis on the ‘Dear Jane’ quilt. These beautiful felines are cousins, superbly adapted to the demands of their habitats. Shy, reclusive hunters, they are seldom seen as they range their territories in search of food, shelter and safe haven. We will trace their past, take measure of their current status, and examine future challenges. Join Exordium for another fact-filled presentation on one of nature’s apex predators. Nomadicare.org supports and preserves traditional Mongolian nomadic culture through healthcare, films and stories. Sas Carey started her connection with Mongolia by trading energy healing for a tour with the American Holistic Nurses Association. As she stepped off the plane, she felt energy shooting through her. At first the goal was to share health care. Upon realizing that nomads provide a model for sustainability and then realizing that the nomadic lifestyle is at risk, her goal became to preserve this lifestyle while it remains through documentary films and books. Come learn what important lessons the nomadic herders can teach us. Birding can be competitive and methodical, or it can be mindful and meditative. Recent studies have shown that noticing birds can improve your mental health, reduce depression and improve memory and attentiveness. Bird Diva Bridget Butler will share the practice of Slow Birding and how you can awaken your innate birding skills and reconnect with nature. She’ll share a variety of techniques that will help you look at birds, listen to them and interpret their behavior that will not only build your skills as a naturalist, but will provide you with a practice that will allow you to slow down and reignite your nature awareness. At one time, decades ago, ten working lighthouses once dotted our beautiful Lake Champlain. In 1949 my Grandfather purchased the Isle La Motte lighthouse, and in 1963 my parents bought the Windmill Point lighthouse, the two most northern lighthouses. Over the many years my late father, Lucky, dreamed of one day returning the light to the original structures. In 2002 this dream came to fruition. Come join me and learn some of the trials and tribulations of being a modern day lighthouse keeper. Dr. Scott Laughlin, Director of the Vermont Granite Museum, will present a cultural and anthropological perspective of Vermont’s granite industry as a tale of hope and loss and of the eager immigrants chasing a dream who shaped our nation’s cemeteries, parks and public architecture. Payment of membership dues entitles subscribers to attend all sessions of the current semester. Lectures are also open to non-members for a fee of $5 per lecture. Semester membership fees are $40 per individual, or $70 per couple. 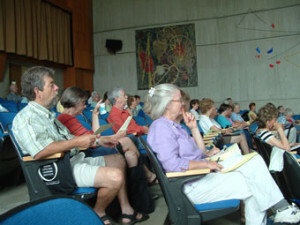 Membership in St. Albans OLLI (Osher Lifelong Learning Institute) entitles members to attend programs in all the OLLI organizations established in seven locations throughout Vermont. Simply present your membership card during the corresponding semester. John Newton, Betty Casavant, Lynda Emch, Bryant Reynolds, Gerard Sparacino, Rita Sparacino.